Environmental, Health and Safety News: If Al Gore Can Outgrow the Ethanol Fad, Why Can’t Conservatives? HTML clipboard The Senate is expected to vote on S. 520, a bill to repeal the 45 cents per gallon volumetric ethanol excise tax credit (VEETC). The bill is co-sponsored by Sens. Tom Coburn (R-Okla.) and Benjamin Cardin (D-Md.). Sens. Diane Feinstein (D-Calif.) and Jim Webb (D-Va.) have also introduced S. 530, which would limit the VEETC to "advanced biofuels," thus ending the subsidy for conventional corn ethanol. S. 530 would also scale back the 54 cents per gallon ethanol import tariff commensurately with the reduction in the tax credit. The VEETC adds about $6 billion annually to the federal deficit. Unlike many other tax credits that reduce a household's or a business's tax liability, the VEETC is a "refundable" tax credit. That means the VEETC is literally paid for out of the U.S. general fund with checks written by the Treasury Department. The protective tariff, for its part, prevents lower-priced Brazilian ethanol from competing in U.S. markets. It increases the price of motor fuel at the pump. Now, you would think supporting S. 520 and S. 530 would be a no-brainer for conservative lawmakers. But some are reportedly getting cold feet. To remind them of their duty to put the general interest of consumers and taxpayers ahead of the special interest of King Corn, I offer the following observations. Should taxpayers have to subsidize ethanol too? 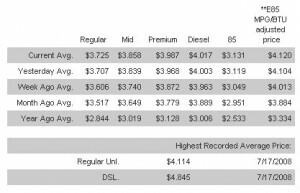 The Ethanol Troika – RFS, VEETC, Protective Tariff – increases consumers' pain at the pump. Because the supply of ethanol, ramped up by the Troika, exceeds demand, ethanol today is cheaper than gasoline by volume. However, ethanol has one-third less energy than an equivalent volume of gasoline. Thus, consumers have to spend more for ethanol than gasoline to drive the same number of miles. The American Automobile Association's Daily Fuel Gauge Report makes this crystal clear by publishing the mileage-adjusted price of E-85 (motor fuel blended with 85% ethanol)... on Fuel Economy Information on Flexible Fuel Vehicles, and then Go to a page comparing how much an average consumer would have to spend annually to fill up each of more than 100 flex-fuel vehicles with regular gasoline and E-85. In every case, the consumer pays about $40-$70 more to fill up with E-85. 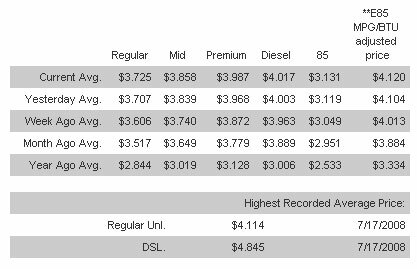 Only a few months ago, when gasoline prices were lower, E-85 customers had to spend $200-$300 more per year. Obvious question for conservative lawmakers: If ethanol is such a great bargain for consumers, why do we need a law to make us buy it?